Dalias may be the perfect cigar in terms of balance and elegance. The 43 RG suits the length perfectly, and lends itself to about an hour and a half smoke time if you adopt a leisurely pace. They feel really nice in the hand–very regal. The varnished boxes used for the 8-9-8 style of presentation (three rows of cigars–8 on the top, 9 in the middle, 8 on the bottom–banded) makes them that more special–and the click of the brooch when you open the box sounds almost like opening a jewelry box. The Encantos were a limited production run like many special release cigars–only 4,000 numbered boxes produced for the Asia Pacific market. I managed to get 2 boxes from 2010. These vitolas have a very distinct tropical fruit aroma when unlit. It smells of lightly caramelized bananas. The draw is perfect, the body is pliant, and the wrapper is nicely oily and on the lighter colorado side. 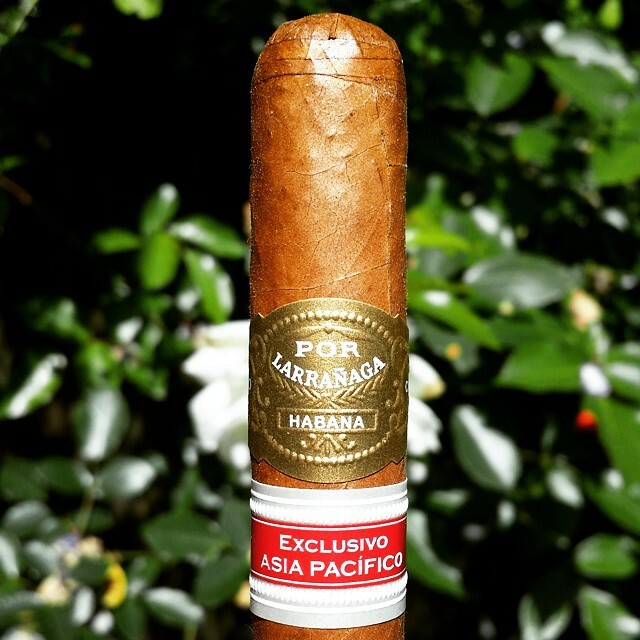 After lighting it has classic Por Larranaga flavors of caramel, burnt sugar, coffee with cream and toast, but on the lighter side. And it has a really nice subtle sweetness to it that is a bit reminiscent of an El Rey Del Mundo Choix Supreme–which is probably why I like this cigar so much. Yum…very faint spice is emerging and I am also getting a nice yeasty-sweet flavor. Sounds like an odd combination but it tastes good. There is also a very pleasing nuttiness present. Nice even burn and lots of smoke. I am having a cup of espresso with heavy cream with this cigar, and it complements it nicely–a nice glass of dry champagne would be really nice as well. Stay away from anything too strongly flavored or heavy with this vitola–it would kill it. These cigars have been aging for about 4 years and I wonder how (and if ) will improve with time–I tasted them 2 years ago and I don’t notice a huge difference with an additional 2 years of aging. They are a pretty light and delicate cigar and I have a feeling that the taste will remain pretty linear over time. The varnished box does slow the aging process so maybe that has something to do with the fact that they haven’t changed much. Further in, the taste is consistent–it stays in a straight line. In fact, it is surprisingly the same all the way through–no deviation from the base notes. I think that can be an asset and a liability depending on the smoker’s mood. Tonight, I was looking for a cigar that didn’t challenge me too much and just went along with the flow and it fit the bill. Almost to the band now…I don’t think I’ll remove it because I am pretty satisfied.